Today’s guest, Ria Greiff, is former therapist turned editor, writer, model, speaker, and public radio host. She hosts two NPR shows on WCBE 90.5, You Inc. and You Tune, and her mission is to elevate the emotional intelligence of the populace. I was honored to be the guest on You Inc. in an episode about multiplicity that aired on 4/29. You Inc. is about giving people the tools to improve their brand, and your brand is You Inc. She’s giving people the ability to maximize their experiences with others so that they can create bridges, instead of dams. Ria practices what she preaches. 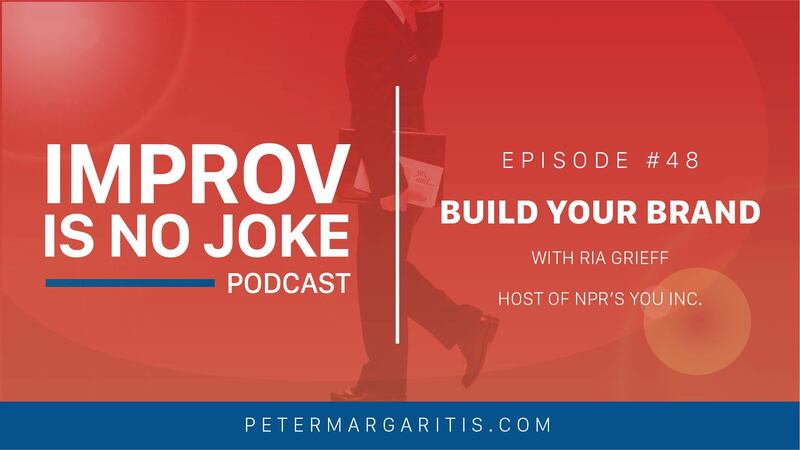 You’ll learn during this episode that presence and trust, two principles of improvisation, were vital tools for achieving her goal – a public radio show. Ria was a persistence presence at WCBE, which gave her the opportunity to demonstrate her talents and build trust. Ria volunteered at the station every day for six months before she submitted a show proposal – and she volunteered for another six months before she hosted a show. We should all be doing the same thing in our own business relationships, or potential business relationships. Who do you want to do business with: someone you trust or someone you don’t know? Someone you trust, obviously. And how do you gain trust? Well, as Ria demonstrated, one reliable way is to be present. Don’t ask for anything – just add value and let that relationship grow over time. As we referenced in the introduction, Ria does a lot more than the radio show! Peter: Ria thank you very much for being a guest on my podcast and taking time out of I know a very busy day that you have. Ria: I’m very happy to be with you again Peter. It’s always nice chatting with you. Peter: and just so the audience knows, Ria and I go back maybe eight months or so. We met last October at a conference we were both speaking at, and you were in attendance at my session I was doing on on using improvisation, about my book, and I asked for a volunteer and you did not hesitate one second. You jumped right up. Peter: We had a blast, then after the fact we found out that we’re both from Columbus and we’ve kept in touch and it’s great to have you on on the podcast. Just give the audience a little bit about who you are what you do. Ria: Okay, well I do quite a bit — many things, as you had mentioned Peter. So I’ll just start with what I’m working on right now, and we chatted a little bit about this before we started. I’m speaking at an event called Pecha Kucha. It’s kind of a speaking engagement and it’s kind of like a TED talk, but the format is 20 photos and you speak on each photo for 20 seconds, for a total of six minutes. And when you’re asked to speak you have to tell a story about something that is remarkable enough to be asked to present it. In this particular case, I had worked as part of a community garden for many years, and then when I joined as the press chair for my civic association we were in charge of a park. Based on my experiences and how rewarding it was for me, for my children, to be a part of growing things and being in the dirt seeing, how rewarding that is, I wanted to move that towards that being a public edibles initiative. And I have read about some of the urban forests that they had in Seattle and I thought you know this would be a really great to be able to provide this for the public for the people who are at the bus stop across the state street; for the people who may be loitering there because they don’t have anywhere else to go; for the people that are shopping at the local businesses; for people that are just walking by, who live in the neighborhood. So I successfully managed to write two grant cycles and received funding in in the form of cash. And then I also got a lot of supplies in terms of soil enrichment, compost, mulch, dirt. And we did really well. We planted a bunch of local native fruit trees like pawpaw, and also like sour cherry. This year we’re getting some nut bushes. Of course we did our herbs. We did all sorts of vegetables as well, and it went really well, so that’s what I’m going to be speaking about this week. I also kind of have my foot in the fashion industry, and we’re gonna give you my little side stuff before we get into the meat. Ria: Recently I was asked to be the model trainer for Columbus college of art and design fashion show. That just happened yesterday, actually. I’m very honored to be a part of that. And also I’m on the board of the Student Fusion Foundation, and that is a foundation that’s also tied into fashion. So that’s kind of my side stuff. My interest is fashion. I published a couple of magazines for a local fashion and music festival also. Now my main thing that I like to do and that I’ve been doing, even though I was trained to be a therapist. At some point in my life I decided I wanted to move into the Wellness – the preventative part of the continuum – as opposed to treatment. So I thought to myself rather than spending one hour with one person dealing with their problems and trying to treat that, wouldn’t it be great if I could speak to larger audiences and be on the preventive end of the continuum? And so I started doing some of that. I think I kind of got bit with that bug when I start doing group therapies, and then just started working on clinical director of my own benefits consulting firm. Started working doing presentations for professionals, for Fortune 500 companies, and then moved into working for a firm out of New York to do some of that stuff, and then that kind of led into doing some of that working, you know speaking at national conferences like the ones that the one that we met at. So true to form for me, I thought to myself one day well I want to reach more people. Ria: and I said, hey, I know what. I want a radio show, and I wanted to have this radio show on this particular station that’s our local national public radio station here in Columbus. It’s 90.5 WCBE are the call letters. We’re moving into syndication in 2018. We also capsulate each one of our broadcasts into podcasts. I do two shows a week. The original show is called You Inc., and the mission of You Inc is to elevate the emotional intelligence of the populace. I feel like, more than ever, there’s just so many people who don’t have the tools to speak to each other, who default to anger, ad hominem types of attacks and logical reasoning. And I really just want to give people the tools to do better for their brand, and your brand is You Inc. I always think of myself as Ria Inc. I’m always thinking to myself what’s good for my brand. So kind of sharing that and giving people the ability to maximize their experiences with others. You know elevate themselves. Enlighten and elevate, and to be able to kind of create bridges instead of dams. Giving those tools. So tools can range from anything from optimism to resiliency to multiplicity, which was the one that we did together when you were on the show. Every week it’s a different tool, and then what I do is I introduce a guest on to the show and this guest is someone who’s particularly successful on wielding this particular wellness tool, and then we do a series of you know little interview questions that pertain to that tool. So that’s You Inc, and then I saw an opportunity to do a little tune-up, a little five-minute module, which is a little bit more lighter in feeling. You Inc. show also go has a library of books and scholarly articles that we refer to so that people can have something to follow up with. Those are all located on our websites and are mentioned in our program and in our podcast. But You Tune, which is the second show, is basically a five-minute tune up. And it talks about that tool but it’s a little bit more humorous. I give a smaller anecdote of how I wielded that tool in my personal life, so that’s kind of a connection. In You Inc we bring on a guest, while I do my little snippet of myself and then in You Tune we also mention a movie, which kind of is also again like more entertainment. So like you, Peter, edutainment is what it’s all about. And you and I have talked about this: I think it’s important to deliver a message in a way where people don’t feel like it’s too preachy or it’s too heavy, and that way it’s just open and available to everyone. And when you get people to enjoy what they’re listening to, they’re more attentive. Rather than feeling like here’s another lesson. I don’t really don’t want to deal with that. And you know I joke about with You Tune, like if you don’t have time to go to a shrink just here’s five minutes with me. Ria: So you can find these things, as I mentioned, the show You Inc and You Tune are both on our local central Ohio NPR station. Our website is WCBE.org. And you can look up You Inc there if you want. We’re also on iTunes and on soundcloud. We even started putting up the little modules because they’re a lot of fun. One thing that I’m also going to be doing soon, and I don’t know how but I’m going to do it, is I’m going to start a YouTube channel also. We’re going to start working on doing fun things with anger management, for example. So you know like when you’re driving and you think that this person who’s swerving in front of you is like you not paying attention, or if they take a turn really slowly it’s because they’re being a jerk, and what we want to show is that you think that that’s what they’re doing but in reality there’s a person there with a cat in a cat carrier taking them to the vet saying don’t worry pookie it’ll be okay. So we’re doing something that’s really funny, kind of like SNL shorts, but that hasn’t launched yet. But anyway, if you want to find us on iTunes it’s You Inc Radio, what the name of the podcast is, and on soundcloud it’s it’s also the same. It’s you inc radio, and you’ll see WCBE FM or NPR. So yeah check us out. You’ll really enjoy it. I’m always looking for feedback. Most of the feedback that we’ve received, not all of it, has been really positive. I think people really are looking for something like this, especially in these types of days we really want to build those bridges. So that’s in a nutshell, I think, what’s going on. I’m also a mom. Peter: I was going to say. Do you spend any time with your two beautiful children, and you have a husband, and I want to do you sleep, and how much coffee do you drink? Ria: [laughs] okay I so my coffee of choice is what’s called the 701 – it’s at our local coffee shop here Cup of Joe. I get a large 701 with two extra shots, and that’s a total of five shots of espresso in that and it’s a large brewed coffee on top of that… so that’s quite a bit and that gets me going. Peter: I would say so. My brother drinks something along those lines, but I have to stop you for a second. We gotta take a huge big uh rewind here. What is the name of the park that you did all this work for and got the grant money and are going to be speaking that six-minute piece on? Ria: It’s portal park it’s a here in clintonville, and it’s the smallest park in the city of Columbus. So one of the things that I’m going to say is like if I can do it there you can do it anywhere. I’m actually looking at other parks that people can duplicate this public edible initiative. Peter: And its portal park. Where’s it located in clintonville? Ria: It’s at 18 East Arcadia, so basically it’s on the corner of Arcadia and High street. Tim Hortons is kind of underneath it, and there’s also Lucky’s market is in the same kind of block. Across then across High Street used to be PJ’s tavern, but they’re closed down now. Peter: Okay, so I do have a fairly large audience here in the columbus ohio area. I suggest that all of you guys go check it out. I’m going to go check it out as well. That just fascinates me that the energy and the drive and the determination that you have to get something done for the community goes way beyond what a lot of people do, and I commend you highly. That was fat that was fascinating to know and I’m going to see if I can come down and watch you do the presentation. Ria: Absolutely. Oh yeah! It’s this thursday. Peter: Do they do this once a month? Is it every couple weeks? Is it once a week? How many times do they do this speaking occasion? Ria: They don’t do it monthly, exactly, or they might do it monthly but it’s not extremely frequently. And then portal park is something that we do. We have people come out. We’re on facebook: friends of portal park. You can come up on any of our care days. We’re also a registered Earth Day site, and so we have about a hundred people come through the week of Earth Day to help kind of do the plantings for spring and things like that. Especially we have 50 bushes coming into that little teeny park the week of Earth Day, so we are a registered site and people come in. So go check out friends of portal park on facebook. Pecha Kucha is also on Facebook, and so is You Inc with Ria Greiff and guests. It’s also on facebook if you want to check us out there. We’re also on Twitter of course. Again it’s a You Inc Radio, and it’s @YouIncTool is our handle. We’re also on Instagram, so you can find us anywhere. Peter: You got social media covered. I’ve been wanting to ask this question, and I haven’t because I wanted to do it on my podcast. Well how did you pitch NPR to give you a radio show? I find that fascinating. Ria: Well I guess I was just driving down the highway and I always listen to this station and I said I want to do this. So I basically just went forward, contacted the station manager, and just told him what my idea was. And the station manager at at WCDE, wonderful gentleman, extremely intelligent. You know he was very busy at the time, and then I managed to contact the support staff person Melanie Wells, to whom I’m always going to be eternally grateful for printing my emails and putting them on his desk, because she loved the concept too. I guess the concept also resonated with the people there, I have to say, and it also coincided with the fact that a lot of shows on NPR are going off the air and have gone off the air, like Car Talk, and so there was this opening. So it was also this incredible opportunity of serendipity to where they’re looking to fill in shows that have been there, historically, for many many many years, and now are going off the air. So I also got very very lucky, in terms of timing. And so I was asked to fill out a proposal and it was mud not a like a one-pager. It was a 10 page proposal. Ria: You had to give evidence towards the effectiveness of what you were doing. The need to support it. But then I also had to do some small modules. I had to do some pilots, and I did. And then the other thing that I did was I made sure that I volunteered at every single possible weekend, so that I wouldn’t go away. It took about six months before I even got approval for the for the proposal. It was a long process. Probably another six months before I even got my pilot on the air. So it was a one year process of just being tenacious and and really just making sure that what I presented was extremely well thought out, and that the format was just very appealing to people. And in fact when people hear the show they just really get a lot of value out of it. So there’s a lot large amount of value out of it, and I think for me the most important part was I didn’t want to do just another talk show. I wanted to do something that was really directly related to offering something that people could use – a tool that they could use to build their brand. Peter: It is a very good show, and tenacity is… that’s you. Peter: but you said something there: that you had the idea, made some connections, but then you volunteered. So they got to know you. When we did our episode, the gentleman who was producing it, he shared a story with me that he was with a radio station here in the Columbus area for many years, left, and wanted to come work at the local NPR station, and he was talking about how he got his job was by spending time volunteering at the radio station, and getting noticed. So I want to put that into the audience. If you’re looking to do something, you’ve got this passion, you want to get in front of a group, one way is obviously through the proposal process or writing or whatever – the other is attending their events, volunteering, meeting people, and making those connections. That goes, as you can hear, it goes a long long long way. Ria: It does, and I myself too have occasionally had interns come and work because this is their way of getting into this medium. So they get to meet people, they get to come to these events, and eventually they get hired. I mean almost every student that has worked with me after graduation has moved on to working in that field that they had worked with me. So I think it’s very important for people to really take that message that like you said – you just got to be there. You just gotta be present. And also people will trust these like, oh I’ve known this person for four years, they’ve always shown up on time, they provided this added value to our brand, so you also get the opportunity to show them that you’re good, you’re trustworthy, and you have something to offer. And then also even better they get used to having you around them. They want to keep having you around. 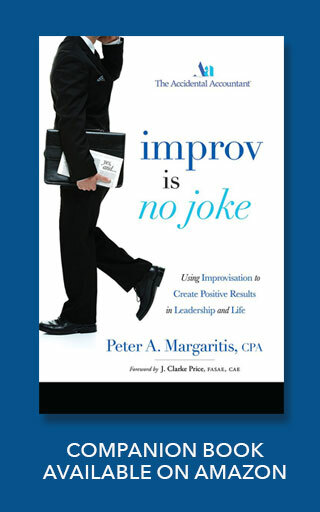 Peter: Right, and I heard a couple words there that resonate in my world of improv. You said the word trust, which is one of the principles of improvisation, and also being present, which is a principle of improvisation. And you’re right. I mean I always say, who do you do business with: people you trust or people you don’t trust? That’s the easy answer, but the challenge is how do you gain someone’s trust. And in this case it was being present. Have them see you and have them get to know you and build that quote unquote relationship over time, to the point where they approved your show, you’re on NPR, and for those of you in central Ohio, in her third episode of this radio show she interviewed some guy by the name of Gene Smith. The athletic director at The Ohio State University. Oh my god! Ria: [laughs] yes he is like a great guy. He’s always been so gracious. I actually worked with Gene on a photo shoot that I did, a spring 10 page fashion spread for our sister media outlet City Scene Columbus, and Kathy Gill is the president and the CEO of that. When I started doing the magazine, my magazine, I had met her at this party and I said Kathy I’m really stumbling across these printing costs. She says get in touch with me. I’ll help you out, and she did. And then after that I was like hey, I do this wellness stuff, how about I write some articles for you? So she occasionally, and actually I have a deadline this week, occasionally she’ll ask me to write an article and we’ll publish it, and then I pitched this fashion idea to her she’s like sure let’s do it. And Gene Smith was one of the people that came to that shoot and we put him on the cover. And then so I was like alright let me see if I could parlay this into a show, and there you go. There you have it. There’s Larry Smith, who also did an episode with us. He is the husband of Piper Kerman from Orange is the new black, so he was also on the show. And him and David are kind of big into storytelling. All these hacks and storytelling and getting people to take that jump to be an entrepreneur, and both of these guys are really inspiring in terms of you just keep putting yourself out there and just don’t be afraid to think about you have something to offer; you have a story, and to just follow that and not to be afraid to take those risks and take those chances. And that’s what I’ve always done and it’s always worked. Peter: It’s what holds a lot of people. That fear of failure. That fear of looking stupid or saying something, but you know what? You got to take a risk. You have to accept failure, not as something negative but as something positive. In a sense of that it’s a learning experience more than anything. Ria: You know I wonder about that sometimes. Like I wonder is it a fear of failure or is it a fear of succeeding? Because honestly, when you when you get to this next level of success let’s say, every time you get to this next you’ll point where you get up and up and higher, then there’s like there’s more pressure. And so now you have to really produce and people have expectations of you, and I think sometimes that’s even scarier. Like when I first got the green light to do this, and I had Gene Smith there, and I’m thinking to myself who do you think you are, Ria? Like who do you think you are? You start to have these ideas you’re like oh my God I’m going to make a full out of myself. You’re more afraid of the success, where people like take you at your word that you can do this and now you have to perform. So I guess it you know it’s both sides of that fear of failure / fear of succeeding kind of thing. And then there’s that pressure because people think oh well she can do this much and then you think they expect a lot from you, but really when I start to feel that way, when I start so overwhelmed that way, I just know that what works for me is to be prepared, to do my homework, and to really push myself to just keep doing more and more. And another thing, my pro tip I would say, if people are looking for a pro tip, don’t look – at at least this is what works for me – I never once, when I was putting my format together for my radio show, I never once looked up what those templates were supposed to be. Never. When I put together articles or when I decided to do fashion shoots, I never looked at how other people did it for me to find out how I should do it. I just did what I thought was right, and of course it’s based on experience, it’s based on excellence, it’s based on doing my research in terms of making sure I have the right information and that I’m really producing something of high quality and high value… but there’s a book that I read it’s called The Cheat Code, which kind of talks about that and it just says just do it. Just go, move forward, and do what you think works… and most people, like if you think about great musicians, great writers, they broke molds, right? The greats just did whatever it is they wanted to do. Like, for example, thinking of a contemporary band that would mirror that would be twenty one pilots, for example. I read something about when they first were getting popular was during the Mumford & Sons type of era, and they had asked them to kind of change their sound. They’re like no way this is what we’re doing, as long as it takes. I think they’re excellent musicians, even farther back like Beastie Boys. People who are great musicians did things because they just did – Queen is another example. Oh my god they’re so talented. So just do what it is that you want to create. Create something new. You don’t have to look for that template. Peter: When you were talking about the fear of success and how you described it takes me back to episode 39 with Maureen Zappala, who talks about this impostor syndrome. This imposter syndrome affects people like ourselves because we’re highly driven, we want to do, but then as you said you sit there getting ready to talk to Gene Smith and you’re like who the heck do I think I am yeah. Peter: Yeah, and I was doing the same thing prior to calling you. Peter: But I think that that that’s also a very valid point. That imposter syndrome, that fear of success, can paralyze some people, because as you said that that level of risk increases. The level of stress increases. The demands on you increase. And I think some people want to jump through it and some people go you know I’m just comfortable right now at this, and I don’t want to attempt that. Ria: mm-hmm, and that’s okay too. Some people are comfortable where they are, and that’s completely okay as well. I can tell you this is not for everyone, where you have to sit there and you are managing multiple individuals, you’re managing multiple projects, you’re creating things, and you’re being on public display. It certainly is not what you would call low pressure. There is constantly on my mind I have to send out this email I have to do this I have to do that. It is a lot to take in, and it’s not for everyone. And that’s fine. I just don’t want people to hold themselves back. If you feel like you want it, just jump into it. Just go for it. Peter: Just go for it, and speaking of your upcoming presentation you said the magic word: in order to be successful at doing that is the preparation that goes into it, and I call it preparation is not perfection. Because you might make a mistake in six minutes; you might make one mistake, but don’t let that one mistake set you back. But the more you prepare, the more you turn it into a conversation versus a presentation, and that’s the ultimate goal in front of any audience – to turn it into a conversation versus a presentation. Ria: Mm-hmm. I like that. I like the way that sounds because you’re right; because if you are prepared, you don’t have to worry about presenting it because it’s already a part of you, and then it can just be something that just comes out and it sounds to the public that it’s organic. And in essence it does become organic because you put that into yourself and it becomes a part of you. So that’s why it feels and it sounds organic, because you have made it a part of who you are. Absolutely. Peter: Yeah. I watch a lot of TED talks and I watch the I watch a lot of speakers, and they look so cool, calm, and collected, and they know their stuff inside and out, but what people tend to forget is all the preparation they put in for that one hour, or all the preparations they put in for that six minutes. Ria: Mm-hmm. mmhmm. Yeah. Thinking about just this six minute thing, I’m going through records, I’m getting old photographs from the park, getting the history of it, I’m going around looking at other parks people can make this happen in. And this for six minutes. Ria: One of the things to, when working with some of my junior staff and some of the interns, like asking them to help develop some of the questions; to see what they come up with, and you know I’ve made this clear. If you can ask a question of this person and any other person on this planet, then it’s not specific enough. This question has to be so specific that it can only be asked of this particular individual. So that, for me, tells me that you have to find out what this person is, you have to link it to something that you read about them, it has to be tied into the tool also, and so that’s that preparation that we talked about. I think that’s when things really come across and that’s why people like to hear things like You Inc and You Tune. It’s because it really is something that has taken time to be developed. When you think about other great things like Saturday Night Live, for example, it’s just so well done, the writing, and you get that feeling of like mind blown. When you read a really good book, and there’s so many of them out there right now, like for example I’m reading this book right now talking about the whole history, I mean this is one who wrote this, the entire history of the settling of New York. From the days of New Amsterdam. Like the whole history, in detail, and you read this and you think to yourself my god this person… how in the world did he do it? And, no doubt, countless hours of pouring over material, assembling it, probably had one of those big story boards out there. It’s just incredible. And it feels good, too. When I was talking to the station manager over there at WCBE, you know it too. Like when you work on something, how do you know you’re done? There’s this moment when you write that one last word and you say that’s it. It’s perfect. That’s it. You just know. You just have this moment of like something clicks, and then when you when you have that moment on the receiving end, people get that moment of mind blow. And so those are some indicators if people are looking for well how do I know? Those are kind of the things that you want to look for to know. Peter: Yeah, you know when… because you struggle to, either, this doesn’t sound right, this doesn’t feel right, something’s missing. Or a lot of comedians, some people think they just come up with these jokes. No. They mine and they craft and they polish them. 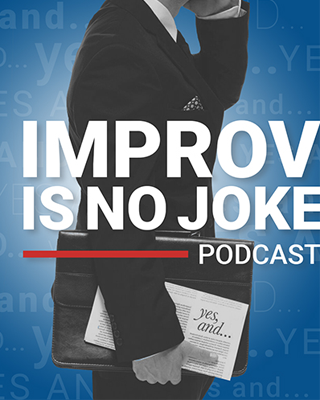 My friend Dan Swartwout, who is a nationally touring comedian who I interviewed back in episode 17. We talked about writing and writing jokes, and the time that you put in trying to craft that, which only lasts for maybe 10 seconds or 30 seconds. The amount of time and energy that you put into it to get it right; to polish it. I remember years ago I wrote a joke that took me two years to complete it. Peter: and it was always stuck in the back of my head and there was something that I was missing. I couldn’t see it, I couldn’t find it, and then that one day I went aha! I got it! and then ta da, I went out and did it and it worked. Okay now I can park that and just keep moving forward. Ria: mm-hmm, exactly. Yep. That is so true. By the way, that book is called The City of Dreams: the 400-year epic history of immigrant New York. One cute thing that I learned from there: Alexander Hamilton was actually not even born in the US. I mean there were a lot of generations of New Yorkers then, but he was an actual immigrant. Alexander Hamilton was. But he was not born in the United States, even back then. Ria: Yeah, not a lot of people know that. Peter: So You Inc… you’ve interviewed some very interesting people. When you talked to Gene Smith the topic was resiliency. Episode 2 with Jamie Goldstein was about creativity. And your initial podcast with Cheryl Harrison was about dreams. Peter: and then ours was about multiplicity. So you’ve got you’ve got these themes that you come in with every week, and you’ve done your work; you’ve done your research. And then you have somewhat of a dialogue with the guests, and actually I had a blast at it. It was a lot of fun, but but as I told you I’m used to being on the asking side not the receiving side, so I will say it was weird at first. Peter: but it also it also gave me a lot more compassion to those who I interview, because I kind of know what they’re going through, and I will post it when our episode goes live. And I can say that I’ve been interviewed on NPR, which thank you very much. That was on my all-time bucket list. Peter: Outside of all of this, what else do you do? I mean you must have a so much free time on your hands. Ria: But there’s this book that came out called Glow Kids, and for all of the parents out there please read this book. It’s kind of like my personal… crusade is a good word. Screens are dopaminergic, so what they do is it creates dopamine in your brain. Same thing as cocaine. So giving children screens is like giving them cocaine, and you can read this book to get the verification. There’s science behind it. It’s very very dangerous. It’s called glow kids. There’s another book that just came out that’s even talking about how it’s really creating addictive behaviors in children and adults. So not only are we just addicted to the screens, but that we addictively shop, we addictively get engaged in other types of screen behaviors, gaining maybe even some other areas. So this book is called irresistible, and just came out, so I am really anti screens. And as a result like I said what we do is we really try to get involved with doing stuff at our rec center, we go to the library once a week, we do we do cultural things. Like I mentioned, listening to classical music live and going to theater performances of that nature, and you know we enjoy doing that quite a bit. So that’s the stuff that we get involved in, in terms of other things that we do right here. My husband and I try to go dancing. Peter: Oh no we have to stop this interview because my wife’s gonna listen to this. We have to stop it right here and stop it right now! Ria: [laughs] Yeah it’s important that we do that also. Yeah so then that’s kind of the other stuff that we do. I think that covers… you got most of Ria encapsulated there. I think you got her. Peter: I think I do, and I do follow you on facebook and thanks for clarifying because I was watching. You were playing Monopoly the other day, weren’t you? With the kids on the floor or something. I’m going Wow, come on Steven get down here, we’re playing some rummy. Get away from my screen. Peter: But you do keep a very busy life. You’re extremely talented. Looking through your LinkedIn bio and I have to ask this question: do you still bartend at the greek festival in columbus? Ria: That’s a good question. [laughs] I used to. I did that for a number of years, but now the greek festival and the contest… I kind of moved into working with contest. I MC at contest now. So I’m heavily involved with that festival. And then the labor day weekend, too, there was another festival, fashion beats music festival, which I published their magazines and I work with their talent and I’m on the board of their fusion foundation. So other things have drawn me away from the greek festival, unfortunately, but it was it was a good time while I did it. It definitely was a very good time. Peter: oh I bet it was. A couple times I’ve worked the saganaki booth there many years ago, and I always looked over here and you guys, the people who were pouring the beer and were pouring the wine and stuff were having just as much fun as we were trying to catch ourselves on fire. Ria: Yeah, absolutely. Absolutely. Because you know then people come over and they say oh come on do Ouzo shot with me, and you have to. You don’t want to offend anyone. You have to. Peter: Quit playing with my dopamine right now. Peter: Well Ria I really appreciate you taking time. I’ve enjoyed this conversation. You brought a lot of ideas that I know that my audience will gravitate to, and I look forward to talking to you again in the near future. Ria: Yeah, thank you, and you know if anyone ever wants to shoot me an email you’re always welcome to do that. You can send me an email at Ria (at) 2rogues.com. Feel free to shoot me an email if you want me to answer a question; if you have an idea. I’m always listening. Peter: Okay, now now that you brought that up, how did you come up with the name of the business as 2 rogues? Ria: Well, so kind of a behind-the-scenes person that helps me out a lot here as my husband, so there’s some of that quality in that he’s one of the Rogues here in the family, but there’s also – and we talked about how you and I have a lot of similarities in this – there’s this kind of analytical side; there’s this creative side. So there’s the lone wolf. The lone wolf is known, also, as being a good parent, and the wolf is just kind of this me a wild figure that’s just out there just doing its thing. And then there’s the the untamable mare, which is another aspect of who I am. So that’s kind of like both sides, and you know the logo kind of shows like these roguish figures, but just feel like it embodied everything that I try to do in terms of just going out there, setting the path, trail blazing, and you know just embodying all sides of these two heads going apart. So embodying both sides of everything. Peter: Thank you for clarifying that for me, and we do we do have a lot in common. Peter: Well thank you again so very much for taking time out. I’ve enjoyed this conversation, and I look forward to a future conversation, as I once said. And I can only imagine where we’ll take that next direction.